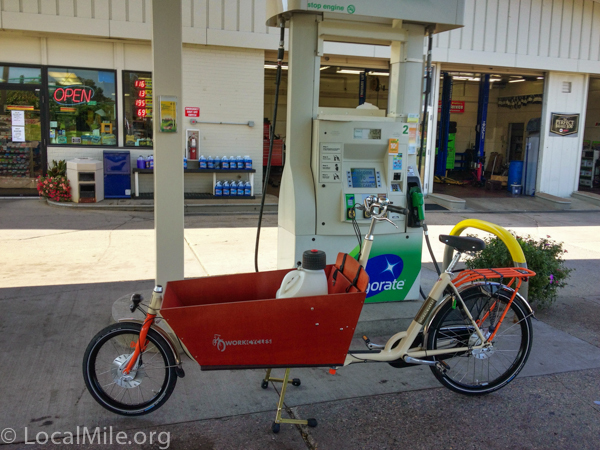 When we need fuel for our boat, I’ll often ride my bakfiets down to the local station (about 1.5 miles each way). Not surprisingly, I get some interesting comments from people and rarely escape without at least one person asking what kind of gas mileage I get. I can carry three 5-gallon cans. Fun stuff. 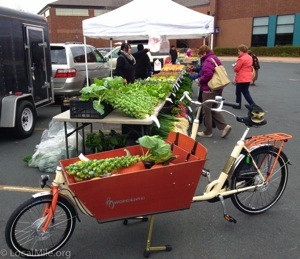 Oh, it also carries 100 lbs of pumpkins, squash, green beans, and brussels sprouts home from the Shoreview Farmer’s Market (I ate most of the raspberries while I was there). 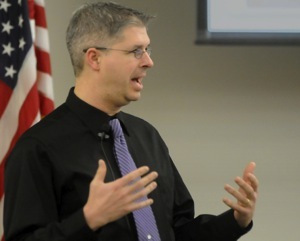 Chuck Marohn, from StrongTowns will be speaking in White Bear on Oct 29th from 6:30 to 8:00 pm. If you have an interest in the financial well-being of your community (Vadnais Heights anyone?) and how to make your community more of a community, you should try to go. These are some road projects coming up in the Northeast Metro (Northern Ramsey County). If you want to see better pedestrian and bicycling facilities included in these projects then make sure you let your county commissioners and appropriate city council folks know. Planning often begins two to four years prior to construction and it’s difficult to get changes included after about 6 months prior to construction. Adding proper pedestrian and bicycle facilities now, during construction, is very minimal cost. If it’s not done now, it will be another 30 years before the chance comes around again. I am not including general signal revisions or mill & overlay projects. These though can be found in the Ramsey County TIP Report. Even though not major projects, these do offer opportunities for improvements to pedestrian and bicycle transportation such as better designed signals and button placements or narrowing of vehicular lanes and/or inclusion of bike lanes, cycle tracks, or paths on mill & overlay projects. Lexington Ave from approx 694 to County Road F (AH/SV) – Reconstruction. Maryland Ave @ Payne Ave (SP) – Reconstruct Geometrics/Signals. Lexington Ave @ Hiway 36 (RV) – Reconstruct Interchange. It is critical that they include adequate pedestrian and bicycle facilities on both sides of Lexington as well as allow safe crossing of Lexington. Hiway 10 @ County Rd H (MV) – Geometrics/Signals. County Rd E @ Snelling (AH) – Bridge Reconstruction. Critical that they include adequate pedestrian and bicycle facilities on both sides of Cty E and include a bicycle path along Snelling (under Cty E). Sadly they have included no safe bicycling facilities where Cty E has been reconstructed this summer between Snelling and Lexington. This is doubly critical to provide students at Bethel Univ with a safe route to Lexington Ave retail (they currently use the railroad line & bridge). Raymond Ave from Hampden Ave to Energy Park Dr. (SP) – Reconstruction. Rice Street from Cty B2 to Cty C2 (RV/LC) – Reconstruction. Hodgson Road from Gramsie to Bridge St. (SV/VH) – Reconstruction. County E2 @ 35W (NB) – Bridge Replacement. White Bear Ave @ 694 (WB/MW) – Interchange Reconstruction. Rice Street from N. Owasso Blvd to Vadnais Blvd (VH/SV/LC) – Interchange Reconstruction.